STATEN ISLAND, N.Y. (September 2018) – More than 300 students at the Richmond Pre-K Center’s three Staten Island locations started the new school year with an assortment of brand new classroom supplies, courtesy of the Staten Island Board of Realtors (SIBOR). The center’s state-of-the-art facilities are located in Bloomfield, Port Richmond Center and St. George. Backpacks and school supplies at the headquarters of the Staten Island Association of Realtors® are destined for distribution to youngsters at the Richmond Pre-K Center’s three Staten Island locations. Now in its 16th year, SIBOR’s “Pack To School” program has provided thousands of backpacks stocked with marble notebooks, a ruler, crayons, washable markers, pocket folders, glue sticks, pencils and a pencil box to Staten Island school children. This year, SIBOR’s goal was to once again provide hundreds of backpacks filled with student essentials, said Linda F. Smith, SIBOR director of membership and coordinator of SIBOR’s Pack To School program. 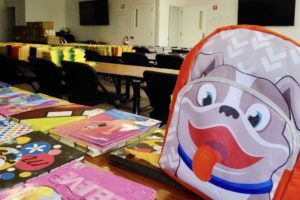 The school products, representing donations and merchandise from the Island’s real estate professionals, were apportioned into backpacks at SIBOR’s headquarters in Bloomfield. “Putting the supplies into the backpacks becomes a large effort with participation by Realtors, family members, students seeking community-service hours, and other volunteers,” Ms. Smith said. Subsequently, Realtor volunteers from across the Island spent a morning personally distributing supply-filled backpacks to the students. In addition to the supplies, each child was presented with a “Best Wishes for a Successful School Year” note. CAPTION: Backpacks and school supplies at the headquarters of the Staten Island Association of Realtors® are destined for distribution to youngsters at the Richmond Pre-K Center’s three Staten Island locations. Next7 Reasons to Work With a REALTOR® When Buying a Home in Staten Island, N.Y.